We Provide a wide spectrum of Valuable Resources for the FoodService Operator. You can find pertinent information and resources for Government Rules & Regulations, Commercial Services, Restaurant Equipment, Legal Resources, Educational Research, Health & Safety, Financial Services, Service Agents, Demographic Information, Restaurant Operation, and Trade Associations. Each type of business structure has advantages and disadvantages. Choosing the right one for you depends on your unique situation—choosing the wrong one can have legal and tax implications down the road. With our Start-a-Business Wizard, you can get help deciding which one may be right for you. Click HERE to use the Business Startup Wizard. I absolutely loved this book. Not only did author Sharon Fullen tell readers exactly what they will need to do to write a business plan, she went out of her way to provide excellent examples, detailed descriptions, amble resources for finding additional and more specific information and much more. I don't think I've read such a complete book before on writing a business plan. The author describes what key things must go in a business plan, how to write the plan yourself or hire someone to do it, doing market research, and cash analysis. I loved her attention to detail. Any question I came up with was answered within the 284-paged book. 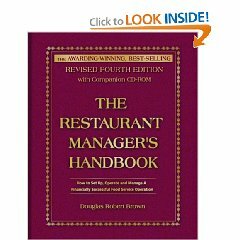 If you're in the process of starting a new restaurant or are managing an existing food service operation, this is the one book you need to do it right. Always wanted a personal assistant at your disposal? Now you will have one, in book form! Designed to save the food service manager both time and money, you won't know how you got along before with out it. There is not one page of information in this incredibly handsome book that is not useful. The book includes every possible form I can think of, and many many more I never thought about which would be incredibly useful to our business today! The companion CD ROM of forms allowed us to use this book from day one. Highly recommended!!! ● Look up yield data for foods. ● Find purchase requirements for a serving. ● Calculate ingredient or recipe costs. ● Look up cost data for foods. This culinary software can be used on its own or to complement The Book of Yields: Accuracy in Food Costing and Purchasing, 8th Edition (Paperback). The Book of Yields CD-ROM can also be used as part of a food and beverage cost control, purchasing, or menu design class. It seems easy. List your business on a discount giant like Groupon and your sales go through the roof. Not even close says Bob Phibbs, the Retail Doctor. List your deal on a site like Groupon and risk losing not just money, but your business. The explosive growth of deal-a-day giants like Groupon has led some small businesses to think that Groupon and its clones are the way to bring in customers. Sure sites like Groupon can sometimes deliver thousands of customers and a sudden influx of business, but rarely do they deliver future sales or repeat customers. Using case studies and months of research, Bob Phibbs, The Retail Doctor®, takes an in-depth look at what makes up one of these deals, what the risks are to business owners and how you can revitalize your business after a Groupon disaster. Free Business Plans - More FREE Business plans from Palo Alto Software, Inc. If you get a pop-up screen asking for a Password, just click the cancel button and the document will download. Restaurant Market Analysis.pdf - University of Wisconsin-Extension Center for Community Economic Development and the Small Business Development Center. A comprehensive checklist that that covers many aspects of the pre-opening process. Copyright 2004-2014 FoodService Resource Associates LLC.